When it comes to providing phone services for inmates, the county jail contracts with CTC (City Tele Coin Company). CTC donated $1,500 to the County Sheriff’s re-election campaign… The county jail contracts with Keefe to provide commissary products to inmates. Keefe also gave the sheriff a campaign contribution. MURFREESBORO – The $9.75 fee Jerry Martin paid, so his daughter could make six phone calls from the jail for another $32.60 charge surprised the father. Martin also found it questionable that he had to pay a $4.65 fee to provide his daughter with a $20 account for commissary products, such as soap, while she spent seven days at the Rutherford County Adult Detention Center. Martin is among those with questions about businesses making money off inmates at a time Sheriff Robert Arnold faces an investigation pertaining to his involvement with the sale of JailCigs (electronic cigarettes) to those incarnated at the county jail, 940 New Salem Highway in Murfreesboro. The FBI and the Tennessee Bureau of Investigation recently raided the home and office of Arnold and Joe Russell, the sheriff’s chief deputy of finance and administration, to execute search warrants. Arnold lists JailCigs as one of the sources of his income, according to a report he filed with the Tennessee Ethics Commission. The JailCigs company is owned by the sheriff’s aunt and uncle, Judy and John Vanderveer, according to Georgia state records that also show that Russell was a founder of the business in 2013. The Sheriff’s Office responded to the investigation by no longer making JailCigs available for families to buy for inmates. The investigation makes parents of inmates such as Martin question where their money is going when paying for products, services and fees available for those incarcerated. Like Martin, Murfreesboro resident Gene Clardy questions if public officials have a conflict of interest by making money on the sale of products and services to inmates. “It’s too big of an opportunity for them to keep things away from inmates just because they have to go through their company,” said Clardy, who like Martin has had to pay fees to provide phone service for a relative who was booked at the jail. When it comes to providing phone services for inmates, the county jail contracts with CTC (City Tele Coin Company). Attempts to reach CTC Vice President David Cotton for a phone interview were unsuccessful. CTC donated $1,500 to Arnold’s re-election campaign in 2013. The county jail contracts with Keefe to provide commissary products to inmates. Keefe in 2012 also gave Arnold a $500 campaign contribution, and Randy Hockett, whose employer was listed as Keefe Commissary on election finance records, also donated $500 to Arnold’s campaign in 2013. Prior to Arnold accepting the campaign money, a contract amendment gave Keefe permission to maintain and supply the Sheriff’s Office with computer equipment and software to expand the Detention Center’s video-visitation system. The amendment is worth “a prorated amount” of $215,106 and is good through Jan. 1, 2018. The Sheriff’s Office works with TouchPay to enable family members such as Martin to set up a commissary account through a fee by using a kiosk machine at the jail lobby. Touchpay regional sales director Keith Benton said another representative for his company would be the one to offer an interview, but no one called back to answer questions for this story. 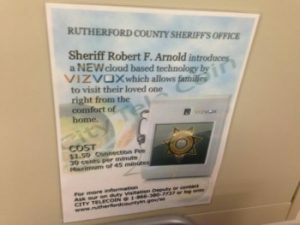 The Sheriff’s Office has used CTC for phone services for inmates for about four years since Arnold won his seat as the Republican sheriff in 2010.